Prior to overland road development, Wisconsin’s rivers and lakes served as the region’s earliest transportation system. The earliest overland routes were Indian trails, which in many cases determined the route of early roads. Roadways were established as settlement spread across the state. Early overland travel in Wisconsin was far from glamorous. Roundabout routes, lack of sufficient bridges, and the frequently mud-clogged, rutted condition of the roads made traveling hazardous and uncomfortable. Crossings by ferryboats were oftentimes prevented, or endangered, by spring ice flows and, in later years, by lumbering operations. Night travel was particularly dangerous with no lighting and was not undertaken except in emergencies. Accidents were common as horses bolted and could not be stopped. Efforts to improve Wisconsin’s poor road conditions and establish a state-supported highway program did not begin until the decade of the 1890s as public support for permanent, safe, and efficient roads spread across the state. In just over a century, Wisconsin’s transportation network evolved from scattered trails and crude roads into a modern network that connects communities within the state, as well as making links to the nation. These pages were developed as a cooperative project between the Wisconsin Historical Society and the Wisconsin Department of Transportation with assistance from Mead and Hunt. 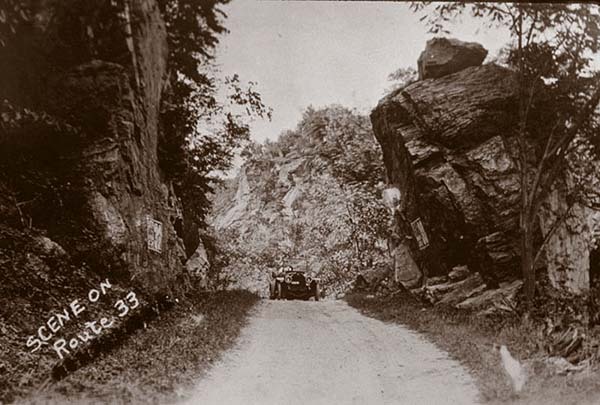 In contrast to the early roads in Wisconsin, which were built by the military or constructed and maintained by towns and municipalities, road development during the early twentieth century was the responsibility of the state. Spurred by the Good Roads Movement of the 1890s, and later by automobile and agricultural lobbyists, the passage of a public roads law in 1911 ushered in a new era of transportation in Wisconsin. During the twentieth century, the state embarked on new programs of road improvements, bridge repairs, and state trunk and interstate highway construction to provide fast, efficient, and relatively safe means of travel.